The AXA DESIGN video switches provide a simple and cost effective solution for switching and distributing your video sources throughout your home or business. Configured to listen to standard Philips Dynalite preset messages these switches can be simply controlled from any Philips Dynalite user interface. The AXA-VC1218 is a flexible video distribution switch matrix providing 12 inputs, each of which may be switched to any/multiple of 18 available outputs. The AXAVC1218 can switch Composite, S-Video and Component sources, provides AC or DC output coupling as well as selectable 6, 7, or 8dB integrated cable drivers capable of driving dual video loads. 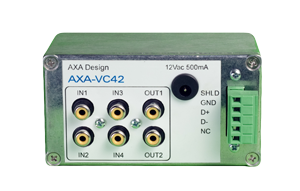 The AXA-VC42 enables devices on a Dynalite network to control the selection between 4 separate composite video inputs to two independent composite video outputs. The input selection is controlled by sending Dynet ‘preset’ messages via the RS485 connections. An area number is assigned to each output and preset 1, 2, 3 or 4 selects input 1, 2, 3 or 4 respectively for each area. Great for switching between security cameras.